For homebuyers seeking to buy a home in a seemingly untouched tropical paradise, the city of Sanibel, Florida, is a must-consider destination. The city of Sanibel, along with a few private foundations and the National Refuge, takes up nearly 70% of Sanibel Island. You will not find any high-rises or even street lights on Sanibel Island, but you will find amazing seafood, gorgeous white sand beaches, breathtaking wildlife viewing opportunities and a charming family-friendly village atmosphere. Sanibel Island is a protected area with flower and palm tree-lined streets, an abundance of glistening shells on its shores and is connected to the mainland by only one three mile causeway bridge. 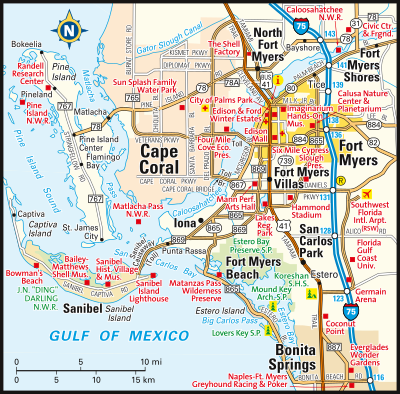 This amazing Southwestern Florida community is situated on the Gulf Coast with the city of Sanibel situated on the eastern side of island. Because of the area’s immense popularity, there are a limited number of homes for sale in Sanibel, so interested homebuyers must act quickly. There are townhomes, low-rise condos and single family homes in Sanibel with home prices depending upon the property’s age, size, style, location and special features. Some homes cost as little as $200,000, while others have listing prices well over $4 million. Unofficially the city is divided into five distinct neighborhoods: East End, Middle Gulf Drive, Periwinkle Way, West End and West Gulf Drive. Any one of these wonderful neighborhoods would be a great place to call home. Other real estate options can be found on the neighboring Island of Captiva. Captiva, like its larger sister island Sanibel, has a very laid-back atmosphere as it sits upon a narrow island in Lee County. From multiple locations on Captiva you can enjoy views of the Gulf of Mexico and the Pine Island Sound. With several resorts and gorgeous uncrowded beaches, Captiva is also a great place to buy a primary residence or a vacation home. Among the many recreational opportunities on Captiva, residents enjoy kayaking, shelling, boating, golfing and tennis. There are also impressive dining and shopping options. In addition to being home to the beautiful Turner Beach, Captiva is also home to many upscale luxury homes. There are a very limited number of historic cottages and condos for sale in Captiva, and home prices vary depending upon the age, size, style, location and special features of the property. That said, typically Captiva homes also range in price from around $220,000 to over $4 million. If you would like more information regarding homes for sale in Sanibel and Captiva Island, Florida, please do not hesitate to contact us today.